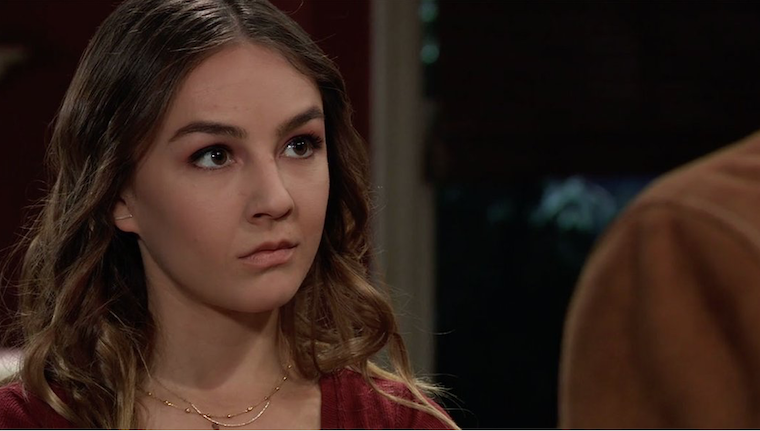 General Hospital Spoilers: Margaux Joins DoD, Kristina Shares Devastating Sonny Secret To Shiloh and Puts Sonny and Her Family In Jeopardy! General Hospital spoilers relate that Oscar Nero (Garren Stitt) and Josslyn Jacks (Eden McCoy) had a plan, Elizabeth Webber (Rebecca Herbst) and Franco Baldwin (Roger Howarth) are struggling with parenting, and Sonny Corinthos (Maurice Bernard) is running out of patience. In case you missed all the Wednesday General Hospital spoilers, catch up now on some highlights with your General Hospital recap. Cameron Spencer (William Lipton) and Trina Robinson (Sydney Mikayla) are hanging with Joss when Oscar arrives. Cameron and Trina are smelling the gossip in the air, because of our probably doomed couple being seen at the County Clerk’s office. The most likely and innocent explanations obviously don’t apply, so they want to know what’s up. The pair is elusive and tries to change the subject. Trina’s wise enough to let it go, but Cameron keeps on. Lucky for Joss and Oscar, Franco chooses that moment to call and ask Cameron to meet him right away. More on that later. Anyway, Trina also excuses herself so the couple can be alone. Cameron’s too dense to understand what she was doing, which she’s quick to point out. So what was the mystery? Apparently, they were planning on getting a marriage license and (obviously) got laughed out of the building. Oscar’s disappointed, but he’s got an idea to try making it up to Joss. He remembered a story she’d told of how people come to a certain place in Paris to leave locks on a bridge, and he wants to do just that as a lasting symbol of what they have. She loves the idea and does her part by using nail polish to put their initials and “4Ever” on the lock he brought. They seal their sort-of marriage with a kiss, and we’re getting nervous. Especially given the preview clips at the end. Will there be a last-minute miracle? Tragedy faster than expected? We’ll have to wait and see. Elizabeth is still concerned after having seen Cameron and Trina together at the hearing, and has enlisted Franco, as Cameron’s step-dad to give another talk. It might not have been her brightest idea (or his best moment), because the “talk” is completely awkward, and Cameron is obviously bothered by this. Especially given that there’s nothing romantic going on with him and Trina. Franco, for the record, never wanted to do this anyway. He thinks he’s the last person to tell someone else how to handle themselves. Elizabeth’s concerns extend beyond Cameron possibly spending some adult time with Trina while they were on that ill-fated road trip. She asks Bobbie Spencer (Jacklyn Zeman) about her own parenting experience and asks for advice, as well as if there’s anything that Bobbie regrets. She does—not being more open about her son coming out. This makes Elizabeth open up about her own concerns regarding Aiden Spencer (Jason David) and what he’s been dealing with. Looks like she’s already got a leg up on Bobbie in that regard, should Aiden turn out to be gay. Sonny is about at his limit with this Kristina Davis (Lexi Ainsworth)/Day of Day situation. He spends some time today taking frustrations out on a punching bag. It only gets worse when Jason Morgan (Steve Burton) arrives and says that Sam McCall (Kelly Monaco) wants more time to get Kristina to leave on her own. Plus, ya know, the worry over whether or not Kristina would point fingers and blame herself should Shiloh (Coby Ryan McLaughlin) have an “accident”. He eventually agrees to stand down for a while longer. He’s not just sitting idle, though, because he tells Jason there’s another option he might be able to explore. Also factoring into his decision is Michael Corinthos (Chad Duell) basically saying the same things that Sam is. He has decided the best thing he can do is to go to Kristina and promise that, while he doesn’t get the Dawn of Day thing, he’ll support her decisions and be a safe, judgement-free place for her. He thinks that will be key, should Kristina see something she doesn’t like. Related to this, Kristina has spilled a juicy still-unknown secret about a member of her family, something that will hurt their standing in the community if it comes out. We’re betting that it has something to do with Sonny specifically. After all, she did go on about her dad having an enforcer to Shiloh before. Now that she’s completed the trust offering, which Shiloh listens to, he tells her she’s ready for the next part: paying ten grand to be a part of their lovely little group. Of course, since she’s such an awesome person and been such a good little brainwashee, he’ll let her pay for it in installments. Kristina eventually goes to Julian Jerome (William deVry) to get the money for it. She claims she doesn’t want to be “beholden” to anyone in her family. We’re thinking she just knows there’s no way in Hell anyone in the Corinthos/Davis clan will cough it up. As for Sam and her scheme, she’s called to Shiloh’s side (after Jason gave her grief about letting their son sit alone with Shiloh and being ordered not to do it again). She’s apparently ready for the next phase, which involves letting him blindfold her and “feeling” their energies. She plays her part well and earns Shiloh’s approval.